Walking side-by-side around the park’s lakeside path, Licata learned that Burgess wanted only minor concessions. Licata brought those back to his coalition of sick-leave supporters, who agreed to most of them. The bill, which had been stuck for years in legislative limbo, began to move. Burgess voiced his support, other councilmembers followed, and Licata wrangled the votes necessary to pass one of the country’s first laws requiring all employers to provide paid sick time to workers. Laws like this help make Seattle the progressive city it is. In the past five years alone, Seattle has become the first major city to enact a $15 minimum wage; banned the use of plastic bags; sanctioned homeless encampments on city property; helped lead the charge on statewide votes for legal marijuana and marriage equality, and more. To hear most residents tell it, this progressive streak is as inevitable as good coffee or the craggy face of Mount Ranier—the natural outcome of a city peopled by good liberals who want to do the right thing. But, as the long fight to win paid sick leave suggests, Seattle’s progressive laws are anything but inevitable. The city’s businesses fight tooth and nail against every attempt to improve worker rights and pay, threatening an exodus to friendlier climates. And while Seattle residents say they want the city to be affordable and want to help the rapidly growing homeless population, they also show up in force to protest affordable-housing measures and proposals to open more temporary homeless encampments. 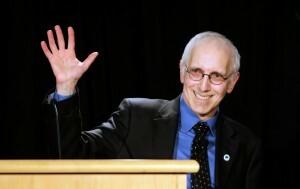 What has fueled Seattle’s progressive victories, then, isn’t some mystery potion or innate Northwestern goodness, but the same hard work that has forced progress in other cities: grassroots organizing, tenacity, and political allies like Nick Licata. For 18 years, Licata has been one of the most reliable forces inside City Hall pushing and prodding Seattle to be a more humane city. Since his election in 1998, Licata has had his hands in every piece of progressive legislation to pass through City Hall. He fought years of serious opposition to pass the Rental Registration and Inspection Ordinance, championed paid sick leave and the $15 minimum wage, created Seattle’s first lobbyist-registration law, pushed for sanctioned homeless encampments, and much more. He also fought against public funding of sports stadiums, a bill to outlaw panhandling, and plenty of other attempts at city-sanctioned discrimination. Throughout his time in office, Licata was doggedly consistent in both his political ideology and his commitment to progressive causes. Among his colleagues, he was often the one vote to the left of all others, but they respected his attention to detail and willingness to work with everyone. Licata’s consistency and legislative success helped him build a citywide progressive base that reelected him every time he ran. Occasionally, it even won him accolades outside his adopted city. The Nation named him Most Valuable Local Official in 2012. Beyond advancing progressive policy, Licata’s time in office helped carve out a space for the current progressive bloc of councilmembers, including Kshama Sawant, Mike O’Brien, and Licata’s longtime legislative aide turned successor, Lisa Herbold. It is of course overly simplistic to draw a straight line from Licata to those that came after him, but his ability to stay true to his values while getting things done helped pull Seattle’s traditionally centrist electeds to the left and proved that voters support progressives. Since his election in 1998, Nick Licata has had his hands in every piece of progressive legislation to pass through Seattle’s City Hall. Last December, Licata finished his final term as a city councilor—a move he was careful not to frame as retirement. He is not ending his political work, just changing the form it takes. Some of his time will be spent working with Local Progress, the nonprofit network of progressive local politicians he helped found in 2012. Some of it will be spent promoting his recently published book, Becoming A Citizen Activist, which is part memoir and part how-to guide for navigating local government. All of it is in service of Licata’s theory of the city as a tool for movement-based social and political change. Licata’s attempt to seed state and national change by fomenting shifts at the local level is, in many respects, the logical conclusion of a career built on grassroots activism. Licata was born in Cleveland in 1947, the son of traditional working-class Catholics who never graduated from high school. His turn towards progressive politics began during his college years at Bowling Green State University, where he helped found the school’s chapter of Students for Democratic Society, and solidified in 1970, when he was a graduate student at the University of Washington protesting the war. After grad school, Licata moved into PRAG House, a commune that would serve as home base for 25 years of organizing and activism that eventually launched his political career. Like a true Renaissance lefty, he had hand in almost all the consequential battles of the age, as well as some of the less consequential ones. He published a directory of Seattle community groups and social services called the People’s Yellow Pages; helped form Coalition Against Redlining; launched an alternative weekly called the Seattle Sun; helped organize an annual 24-hour dance marathon called Give Peace A Dance to raise money for nuclear disarmament TV ads; and co-founded Citizens For More Important Things to fight public funding of new baseball and football stadiums in Seattle, among other things. Much of Licata’s activist career was paid for by his work as an insurance broker, a kind of Wallace Stevens of the activist left. But after 15 years of this arrangement, Licata was unhappy and his bosses expected him to become a manager. He left to run for city council. In Licata’s first run at council, he was the underdog against Aaron Ostrom, a popular city staffer with establishment backing. Despite being outspent and running without major endorsements, Licata was able to organize his broad activist networks to show up at the polls and elect him. “I was somewhat isolated [as a progressive]. I could tell my new colleagues thought I was going to be temporary. The first day in office I didn’t have a chair, though I think it was an oversight,” Licata said. Nonetheless, Licata managed to prove his efficacy. Years of working in insurance gave him a keen eye for detail and in his first year in office, he found an extra $50,000 that had not been allocated in the budget. Licata’s attempt to seed state and national change by fomenting shifts at the local level is the logical conclusion of a career built on grassroots activism. He also proved he knew how to work the system. Licata’s first major victory was killing Seattle’s bid to host the 2012 Olympics. But as he dug into the contract and read about other host cities, Licata realized Seattle would have to take on any financial liabilities from the games and likely wind up with a pile of debt. “The people we’re supposed to serve most, not the tourists, not the people coming in, not the investors, not the businesses, but the people living here? They don’t gain. In fact a lot of them lose,” Licata said. He started his uphill battle with his most conservative colleagues, highlighting the financial case against hosting the Olympics. He got his message out to local journalists who started covering the issue. He also hosted a public forum downtown in the go-to journalist watering hole. The room was packed with people who had come to listen to a panel of experts make the case against the Olympics (the pro side declined his invitation). He commissioned a countywide poll that showed people were against the bid when they knew about the debt. The council slowly came around and, in the end, eight of nine members signed a letter in opposition to the bid. Because no councilmember was willing to sponsor a resolution in support, the issue died. Licata’s organizer approach to legislating and willingness to work with everyone was a recurring theme of his time in office and served him well in his proudest victories. Getting the Rental Registration and Inspection Ordinance—a basic law that requires landlords to register rental properties so the city can make sure they’re up to code—took six years of negotiations between advocates and the Rental Housing Association. The Paid Sick and Safe Time bill was a similarly big lift that required years of brokering negotiation between labor, activists, and businesses. Councilman O’Brien says that tenacity was an example of Licata at his best. “He’s watching it and figuring out ‘where are my votes, who’s with me, now where do I get the next vote? I think we need to have a brown bag, we need a town hall, I need to build momentum. What are the obstacles that keep you from supporting this? Can we work on that?’” O’Brien explained. Licata readily admits he can’t take sole credit for $15 Now’s success or many of the city’s big progressive victories. But he’s proud of the role he’s played as an activist on the inside connecting the fist-raised activists he came up with and the establishment whose support and votes are critical for political success. Now that he’s left office, Licata wants to see if he can take his mid-fielding talents national to see if cities’ progressive momentum can combat state and national conservatism. The idea that like-minded local politicians need to work together to bolster regional and national progressive policy is at the heart of Local Progress, the nonprofit Licata co-founded with New York City Councilman Brad Lander in 2012. They point to the minimum-wage movement as example of their success. The $15 Now effort started in Seattle then spread to other cities and gained enough momentum to get introduced at state and national levels. The organization is young and only recently raised enough money to hire staff, but it has succeeded in recruiting 400 members in 40 states, the majority of whom are elected officials. Local Progress’ work is a mix of big-picture enthusiasm building and nitty-gritty policy work. Licata is working part-time with Local Progress to explore how best to accomplish regional organizing. The work is rooted in a feeling that there’s no choice but to focus on cities. Michael Kazin, Georgetown University history professor and co-editor of Dissent magazine, agreed that ever-more-progressive city politics have helped shift the national conversation. But without a corresponding movement of national progressives activists, local politicians can only do so much. “There has to be a left populist movement. It can’t at all dismiss the importance of race and gender and sexual orientation and environment. All that’s right. But you’re not going to win majority without having a majority,” said Kazin. That is, in some ways, what Licata hopes to engender with his new book. As the name implies, Becoming A Citizen Activist is Licata’s attempt to share the lessons he’s learned to help people effectively navigate city politics. Perhaps the most important of those lessons is that success comes from barely perceptible micro-victories that build into movements and major victories in the long term. Licata’s 18 years in office and over 40 years of community activism in Seattle are certainly evidence of that. His many losses and half wins and small steps forward have added up to marked change in Seattle over time. Of course, like most cities, Seattle is still a deeply inequitable place with a growing gap between rich and poor. But Licata’s work has helped give progressives a platform from which to combat those inequities. And given that, it seems possible that bringing that same detail-focused, local approach to the national stage might eventually bring about national progressive change.